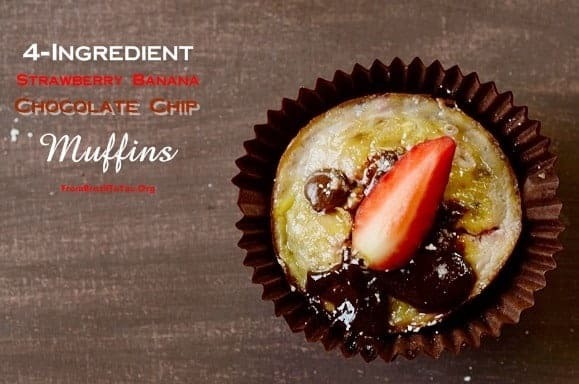 I ain’t kidding, folks… there are really only four ingredients in these muffins: ripe bananas, eggs, strawberries, and chocolate chips. This recipe is so easy that a kid could make it. 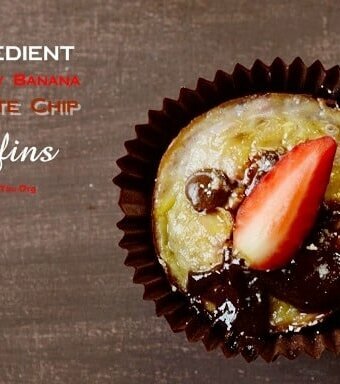 All you have to do is to whisk mashed bananas with eggs, stir in chopped strawberries and chocolate chips, and bake for about 10-18 minutes. That’s it! This is one of those recipes that you can make just from memory… and I thank Tip Hero for the inspiration. I woke up early feeling like I was in a race — having to prepare breakfast up against the clock, and then to serve it to my children before they leave for school. When my husband can’t take them, I’m the one who has to face traffic and even a line to take them in. Having something quick yet healthy to serve them, and also to take with me on the way, is a blessing. 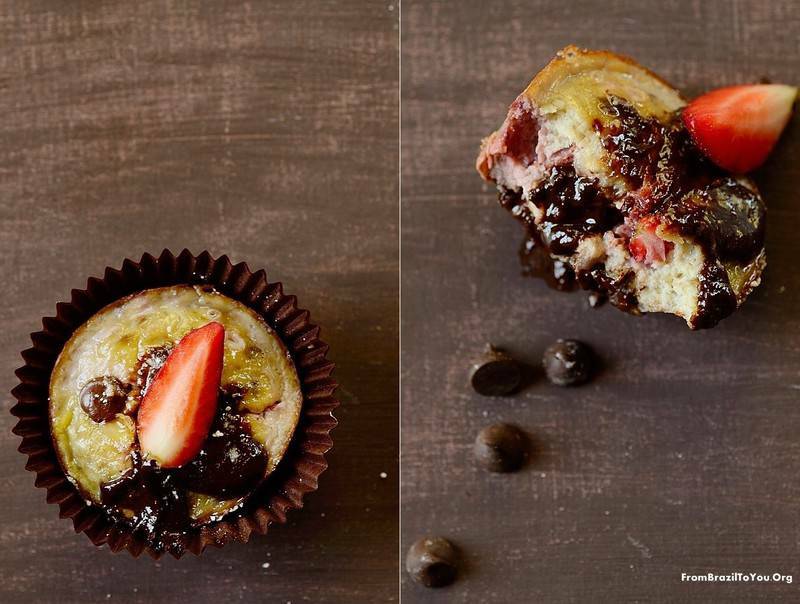 Even if you don’t have children, these Strawberry Banana Chocolate Chip Muffins will ease your commute to work. Just put them in a brown bag to devour with a cup of joe on the way… They will easily put a smile on your face! After all, it is all about making life easy — for you and me! 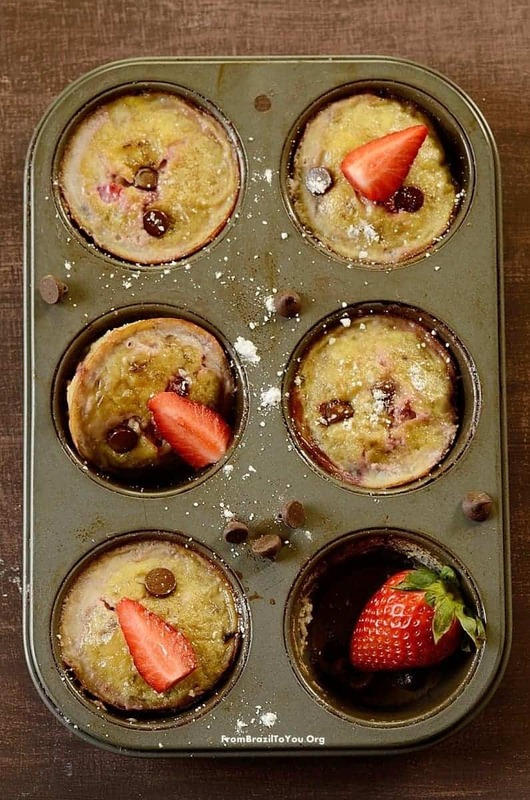 Gluten-free, 4-ingredient Strawberry Banana Chocolate Chip Muffins that are easy and quick to make for a grab and go breakfast or snack. Preheat oven to 375°F (190°C). Spray down either a 6-cup standard-size or a 12-cup mini muffin pan with non-stick cooking spray and reserve. In a medium bowl, mash the bananas with a fork and then whisk in the eggs. Stir in the chocolate chips. Place an equal amount of the finely chopped strawberries into each muffin compartment. Pour the banana/egg/chocolate chip mixture on top. Beat the muffin tin against a hard surface to remove air bubbles from the muffin mixture. Bake for approximately 17-18 minutes (standard-size) or 10-12 minutes (mini), or until muffins are set. Let them cool slightly and remove from the pan. Sprinkle/sift a bit of powdered sugar on top, if desired. Enjoy! YIELD: 6-8 standard-size muffins or 12 mini muffins. Wow I cant believe you just used 4 ingredients in this muffin, it looks really good, such a nice dessert! Thanks, Raymund. They are pretty good. I hope you have the chance to try it. What a fun, healthy breakfast option. We all need more of those! I love this kind or recipes, that you only need 3, 4 or 5 ingreadients. Super way to start the day Denise! 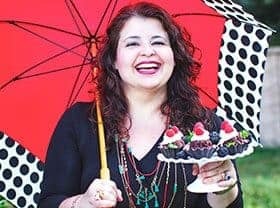 Protein from the eggs, fiber and sweetness from the fruit, what a powerful recipe.This is a must try! Hi Denise! Hope you and your family had a lovely Easter! I’m sure you prepared a feast! Love these easy muffins! It really is a chore trying to I think of breakfast. Thankfully, my kids are mostly grown and they get their own now, but for us these would make a great snack or even dessert. Easy and fast! Not to mention really, really good. Can’t beat that. Super recipe — thanks. Only 4 ingredients for such delectable muffins. Incredible! I am so making this recipe. The oozy, melty chocolate chips are going to feature in my dreams tonight. 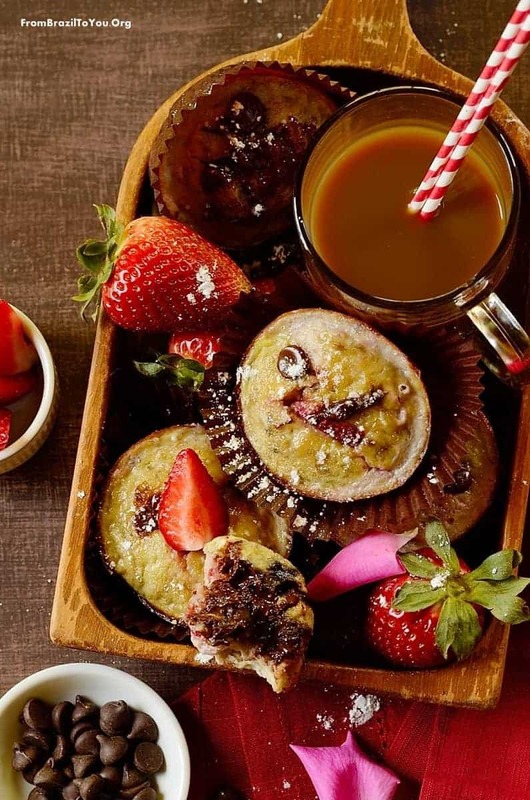 It sounds amazing, I will definitely try these muffins, only have to get some strawberries. My kids would love to make these themselves for sure. These look fantastic dear Denise! Plus, we have an abundance of strawberries these days since they’re in season making this a perfect choice for an easy, quick, yummy treat! Have a beautiful day ahead! Hugs! Something easy yet healthy for busy mornings — life is a fast-pacing event! That looks so good, Denise. Just what I love.